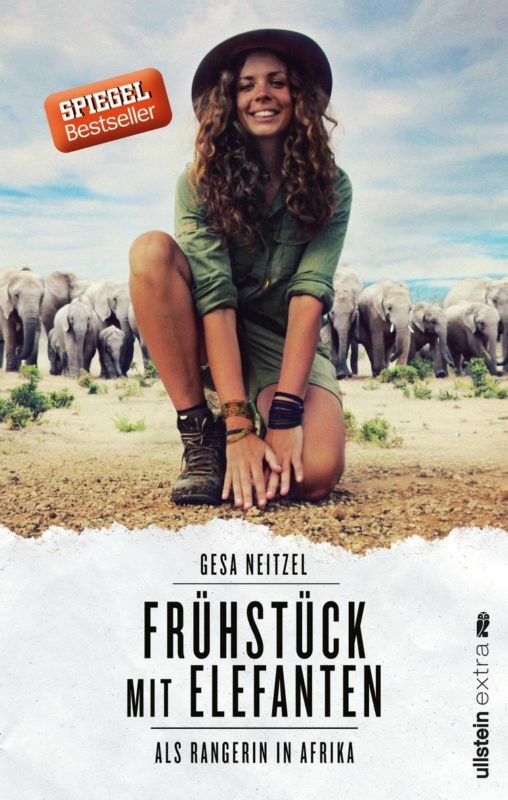 "The Bestseller by Gesa Neitzel"
Leaving everything behind, going to Africa and training to become a ranger – is that unbelievably brave or the crazy idea of someone who is runs away from life? While Gesa is still thinking about it, she ends up on in her African adventure. She learns everything about elephants and yellow-billed hornbills, the art of tracking and astronomy and has to not only face some tests, but also her biggest fears. She writes of breathtaking encounters with lions, of barefoot walks through the savannah, of long nights under the starry sky – and about a life that finally begins. Gesa Neitzel is a German bestselling author and private safari guide, traveling the African wilderness together with her partner in crime, guide and photographer Frank Steenhuisen. They are all about Nature, elephants, bush walks, starry nights and their beloved Land Rover Defender Ellie. Neitzel’s bestselling memoire “Frühstück mit Elefanten” (Breakfast with elephants) hit a nerve in the young German travel community. She is regularly featured in magazines and newspapers and talks about wildlife and elephants as a guest in major television shows across the country. She recently teamed up with well-renowned German airline LUFTHANSA for the #LIFECHANGINGPLACES campaign – telling her story countrywide on major billboards and tv, as well as cinemas and print. Unfortunately the book has only been published in German, so you either have to learn German or wait until it will be published in English (hopefully soon!). “My story begins in Berlin. In the city that I have called my home for ten years. I’m sitting in the commute on my way to work. In fact, I’ve already gone two stations too far without noticing. That happens to me quite a lot recently. The headphones in my ears and a blurred expression in my eyes, I slurp my morning coffee and crumble pastry splinters of croissant on my jacket, while I dream of a life without a station where I have to get off again and again. I’ve always wanted to leave. Go away. To be free. That’s what’s inside me. So I left home right after my A-levels. But with my 19 years I didn’t really know where to go and what I wanted. That’s why I went to Berlin. From the small town to the big city – that was at least a change that could be proven by the number of inhabitants. Through detours I came to a life that worked. I work as an editor for television – a job that is certainly not boring. I have my own little apartment and I travel once a year. I write a travel blog about my trips to the wide world. I have a handful of good friends and a park outside the door. I could be satisfied. No, I should be satisfied. Not being satisfied is even quite unfair. To life, to others and to myself. I should enjoy every day and be grateful and I should not dream so much. But I just can’t help it. Mum and I are cooking – she in her kitchen in Hildesheim, me in mine. We both have the telephone clamped between ear and shoulder as we cutting vegetables – it would not surprise me, if we even cook the same. For years, our conversations have revolved around the same topic again and again: Berlin. Or not. Mama reminds me during these telephone calls of Rainald Grebe, who sings about the capital with a pompous “Hallelujah, Berlin” in his Brandenburg anthem. Now is the moment when I have to burst the bomb. I know that. But I can’t. I can’t bring it over my lips. Maybe because I think myself that what I have to say sounds a little ridiculous. Instead of opening my mouth, I let the silence at my end of the line speak volumes. Always works. “What? Do you really want to go to Africa now? It’s no accident that Mama came up with it all by herself. Even during the choppy Skype calls from South Africa, my enthusiasm for this country had literally jumped through to the listener. Now Mum is the one who is quiet – and gives me space to put my new plan into words. The situation is anything but new for us. When a family holds together as strongly as ours, everyone knows each other’s quirks – and sees them coming from afar. My quirk is restlessness. Even as a child I could never sit still for long, I always had to do something, implement new ideas, explore new shores. I’m like a shark that has to keep moving all the time. Stagnation would be death. Mum still doesn’t say anything, that’s why I start now. It all bubbles out of me like mineral water from a bottle that was shaken properly before. The words tumble and are hard to make sense of. I didn’t expect that. I didn’t want to ask permission with this call, but I can’t and don’t want to do anything my parents can’t stand behind. My family is my compass. Each one of us has a point of the compass. And each of us has an influence on the lives of the other three. I have been searching for so long for something that makes me happy, something that fascinates me. For parents it must be an almost unbearable feeling when their own child seems so lost. But it never seemed like that to me. I always knew: If I don’t give up, if I keep looking, then one day I will find the right thing for me. My parents always kept my back free. No matter what I have done over the years, they could still somehow make peace with every idea. So I shouldn’t have been surprised that Africa wouldn’t change that either. “And what do you learn as a ranger,” Mum asks. “Well, maybe it’s a bit like a boy scout,” I explain, “you’re out all day and learn everything about the animals and nature, you learn track reading and astronomy, but you also learn how to guide safari guests through the wilderness – either with an off-road vehicle or on foot. After that, I’d rather change the subject. I don’t want to scare her. But it is too late. Do you want to know more about the book or go on safari with Gesa & Frank? Just contact us and we are happy to help!